The Percy Almshouses at the bottom of Elm Grove were erected in 1795 (see “Lewes Road “), but they remained in a quite isolated position until the construction of Hanover Crescent and Hanover Street in about 1822. 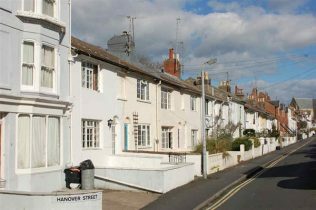 However, most of the densely-populated district which has become known as Hanover was developed from about 1860, typically small terraces with angular window bays. 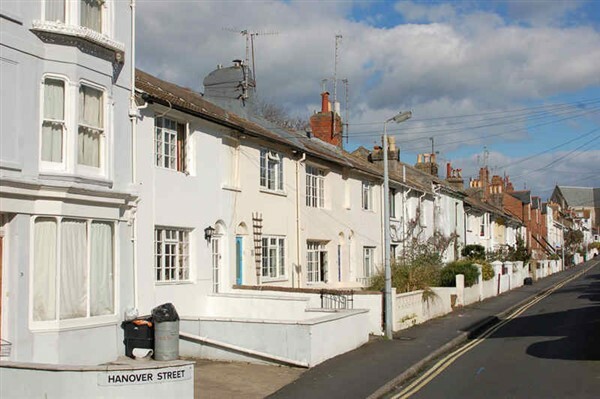 Hanover ward was first designated in 1894, covering the area between Lewes Road, Southover Street , Queen’s Park Road and Elm Grove , but it has been expanded since to include the area between Lewes Road, Grand Parade, Carlton Hill, Queen’s Park Road, Pankhurst Road, Freshfield Road, Elm Grove and Franklin Road. Since being designated a ‘general improvement area’ in 1969-76, Hanover has become a more attractive residential district and has escaped the massive redevelopment of the adjacent Albion Hill area. Together with Albion Hill , Hanover has a population of around 7,500. Hanover Crescent itself consists of twenty-four grand, listed houses which were completed by A.H.Wilds for one Henry Brooker in about 1822, the year in which the Level was laid out. Despite the use of bow fronts, shell motifs, and Corinthian and ammonite pilasters, they do not, however, form a unified composition. In 1844-6 11 Hanover Crescent was the home of Sir Rowland Hill, the originator of the penny post and the chairman of the London and Brighton Railway Company from 1843, while novelist Horace Smith lived at no.10 from 1826 until 1840 before moving to Cavendish Place. The two lodges, single-storey buildings with Tuscan columns and pediments, are also listed, as is the garden wall; the small garden itself was taken over by the corporation in 1884 following the Brighton Improvement Act. 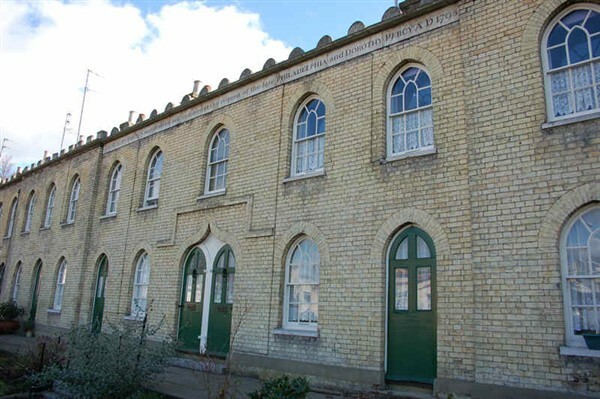 Cobden Road public slipper baths were opened in April 1894 by the mayor, Sir Joseph Ewart, in a red-brick building with shell and dolphin decorations at the corner of Islingword Road. 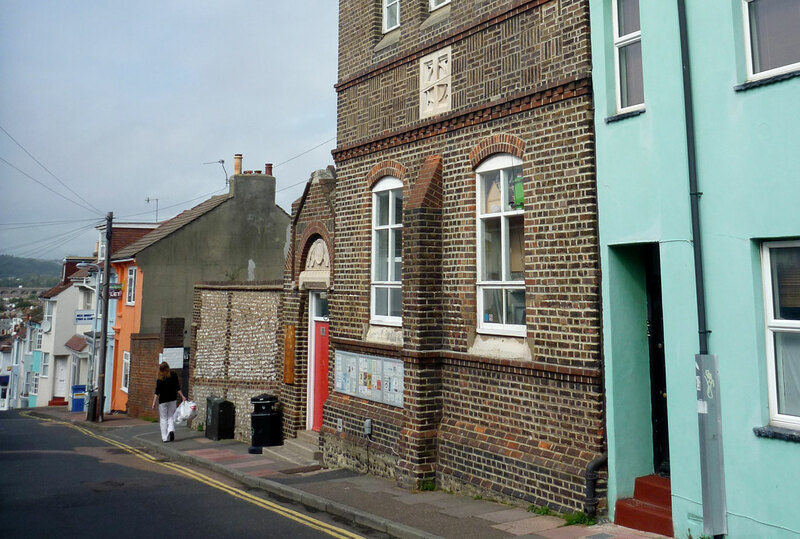 Closing in 1976, the building was used as the Hanover Community Centre until 1982 and then as a resource centre, but it was converted into flats in 1985-6 with the inaugural tablet remaining in the entrance hall. The information on this page was taken from the My Brighton and Hove website. Josie's second page : The history of allotments.